The tubercle articulates with all the transverse process of the numerically corresponding vertebra to create a synovial joint. It’s absent in 11th and 12th ribs. Plane type of synovial joint. Capsular ligament (joint capsule): It’s thin fibrous sac enclosing the joint. 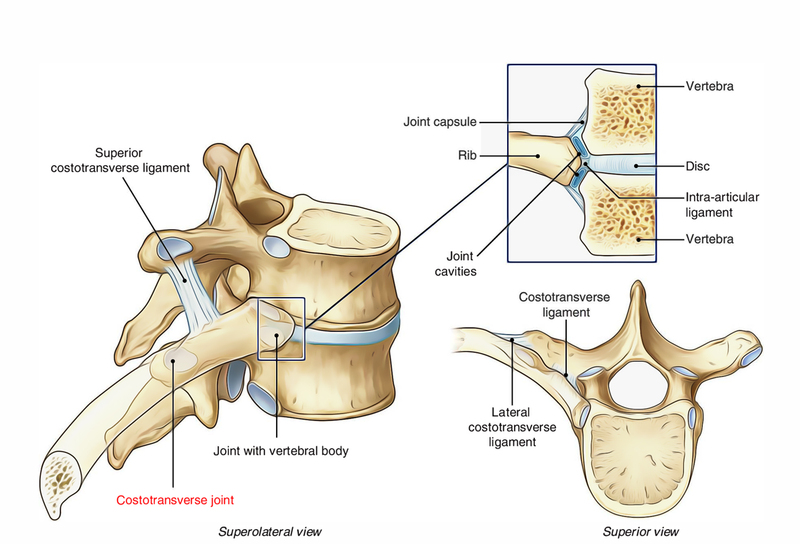 Superior costotransverse ligament: it’s 2 layers– anterior and posterior. The anterior layer stretches between the crest of rib and lower aspect of transverse process of vertebra above. The posterior layer stretches between the posterior aspects of the neck to the transverse process above. Inferior costotransverse ligament: It stretches from posterior aspect of the neck of rib to the transverse process of its own vertebra. Lateral transverse ligament: It stretches between non- articular parts of tubercle to the tip of transverse process.